The landscape is rapidly changing for the enforceability of covenants not to compete in employment contracts, agreements for the sale of medical practices, medical practice partnership dissolution agreements and shareholder agreements for physicians and other healthcare providers. 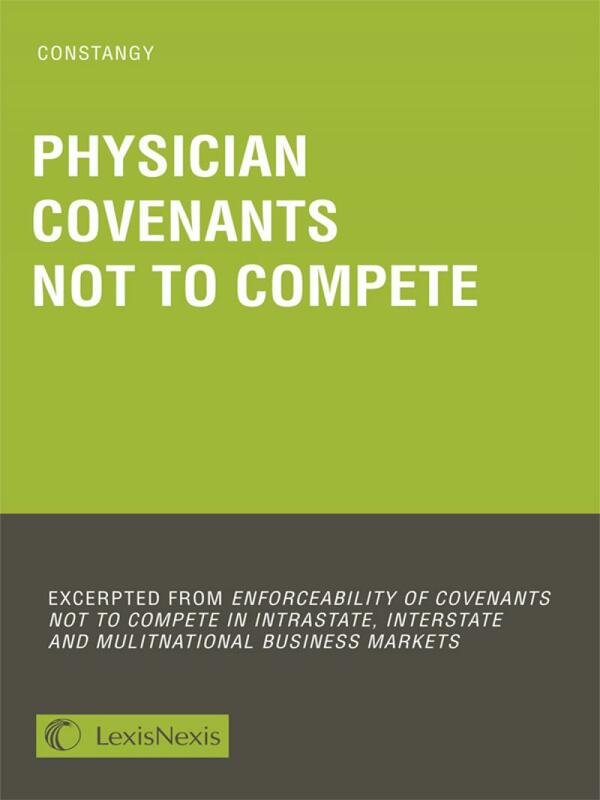 This chapter explores the legal issues related to physicians covenants not to compete, providing practical guidance, expert anlaysis and state law discussion. Faced with a non-compete agreement for a doctor, nurse, dentist, veterinarian, physical therapist, or other health care provider*? Use of such agreements—collectively referred to as physician covenants not to compete—is dramatically expanding. 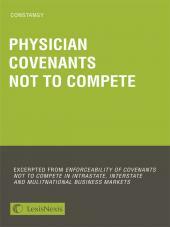 This concise guide explores the legal issues related to physician covenants not to compete. It is an essential and comprehensive tool for advising and counseling clients and litigating related claims. Practice tips and drafting notes are provided to assist in creating legally sound physician covenants not to compete. State law distinctions are also included. The Honorable William Constangy is a highly seasoned expert, bringing a wealth of practical insights and litigation-tested advice to the area of covenants not to compete. The guide is excerpted from the upcoming new treatise entitled Enforceability of Covenants Not to Compete in Intrastate, Interstate and Multinational Business Markets.  Acupuncturist, Allergist, Anesthesiologist, Anesthetist, Cardiologist, Chiropractor, Dermatologist, Endocrinologist, Family Practitioner, Gastroenterologist, Gynecologist, Hematologist, Immunologist, Internist, Nephrologist, Neurologist, Neurosurgeon, Nurse Practitioner, Obstetrician, Oncologist, Ophthalmologist, Optician, Oral Surgeon, Orthodontist, Orthopedist, Osteopath, Otolaryngologist, Pathologist, Pediatrician, Physiatrist, Physician’s Assistant, Podiatrist, Proctologist, Psychiatrist, Psychologist, Pulmonologist, Radiologist, Rheumatologist, Surgeon, Urologist. A graduate of Wake Forest University (1964) and Duke University School Law (1967), H. William Constangy engaged in employment and civil law practice in Charlotte, North Carolina for eighteen years. From 1989 to 2014, he served as a North Carolina trial court judge, retiring as a full-time Resident Superior Court Judge in 2014. He is an active certified North Carolina Superior Court Mediator and approved American Arbitration Association Arbitrator. He is also a frequent lecturer and the author of a legal treatise on North Carolina employment law and numerous law review and other articles on various facets of covenants not to compete and employment law. He has served as a member of the North Carolina Statutes Commission. He is the recipient of The Order of the Long Leaf Pine award from the Governor of North Carolina, the 2014 Leaders in the Law Award from Lawyers Weekly and Elon University School of Law and has been recognized in Who's Who in American Law, Who's Who Among Emerging Leaders in the United States, and Who's in the South and Southwest. This guide will also appear as a chapter in upcoming new treatise entitled Enforceability of Covenants Not to Compete in Intrastate, Interstate and Multinational Business Markets.